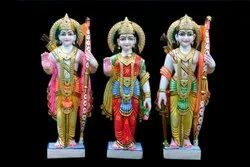 Prominent & Leading Manufacturer from Jaipur, we offer decorative ram darbar, ram darbar colored statues and ram darbar marble statue. Clients can avail a immaculate array of Decorative Ram Darbar from us at reasonable prices. We design these statues using premium grade marble that is procured from the trusted vendors of the industry, so as to ensure their resistance to cracks. In addition, these statues are renowned in the domain for their excellent finish and charming appearance. 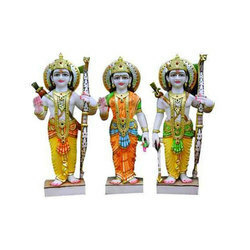 To assure that these statues reach to the customers in their original forms, we use superior grade packaging material. 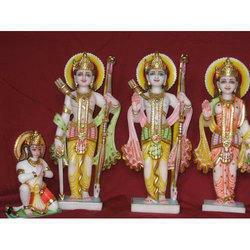 Our company offers a full set of Ram Darbar Colored Statues where we offer sculptures of Ram, Laxman and Sita. These are designed and have a flat bottom for perfect placing. All the three sculptures are independent and can be set as required by the customer. Our products are widely acclaimed for there beautiful craftsmanship and artistic looks. These are widely available in the market at reasonable rates. The Ramdarbar statue is done with white marble.Beautiful colours and goldwork make it live like.